No matter how many times I move the mouthwash to its designated (out of sight) place under the sink, it always ends up back where it’s seen and used most, next to the faucet. And since the typical plastic bottles are less than eye-catching, I knew I needed to come up with a stylish solution. At first, I envisioned a beautiful oversized wine decanter filled with the topaz-blue liquid, but I knew I didn’t have the counter space for that and expected to get few eye rolls from Brian. Then, while out at a bar (where all great ideas happen), I noticed the mixologist pouring syrups from glass bottles topped with open-ended spouts. This was my solution! This quick and attractive fix has been great. The pour spout eliminates the need for cups (let’s be honest, who really uses those anyway? ), since you can let the mouthwash flow directly into your mouth right from the bottle without ever touching your lips. And, if you have guests, you don’t need to be grossed out by them taking a swig. 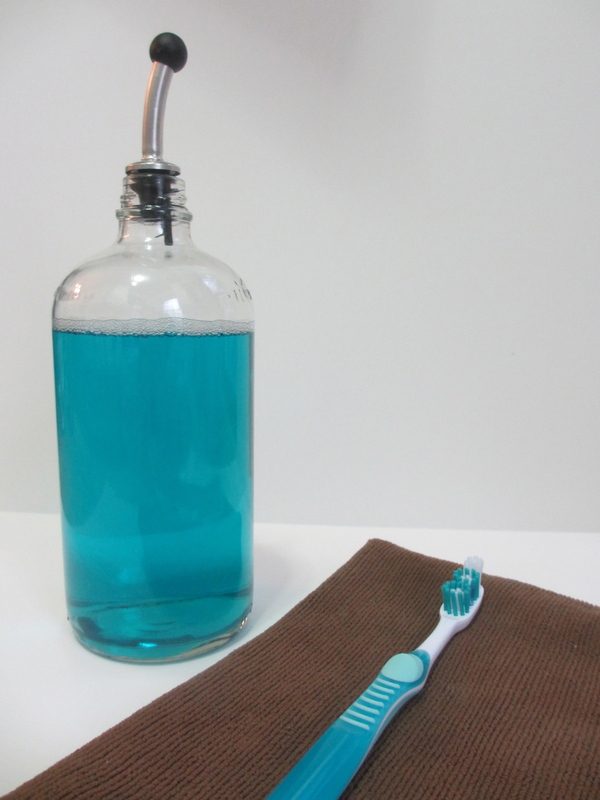 Simply wash and dry out a bottle that’s your desired size, fill with mouthwash (a funnel may be helpful) and top with a metal pourer. How fresh! SWWU Tip 1: You can purchase pour spouts at restaurant supply stores, some liquor stores and possibly even your local supermarket. SWWU Tip 2: Make sure you have a snug fit between your bottle and the pourer to prevent leaks. You may need to try a few different combos before you find the perfect match. This entry was posted in At Home and tagged @SWWUblog, at home, bathroom decor, cheap trick, home decor, home projects, mouthwash, organization, storage solution by Something We Whipped Up. Bookmark the permalink. We did this…what a simple great idea! !